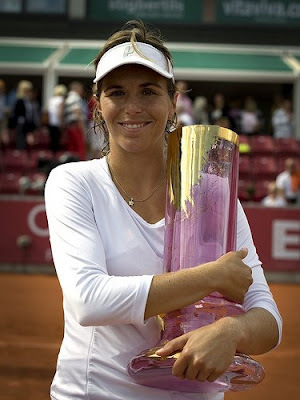 Maria Jose Martinez Sanchez beat top-seeded and defending champion Caroline Wozniacki 7-5, 6-4 Saturday to win the Swedish Open for her second WTA Tour title. The unseeded Spaniard won her first title in Bogota in February. “This was the most enjoyable tournament for me so far this season,” Martinez Sanchez said. “I’m sorry I spoiled your (birthday) celebrations, but I promise I will buy you something instead,” Martinez Sanchez told Wozniacki at the post-match news conference. Wozniacki, who turned 19 Saturday, is ranked ninth in the world and has won five WTA titles. “Maria played better than me. She played smart and it was difficult to get a rhythm with her stop volleys,” Wozniacki said. 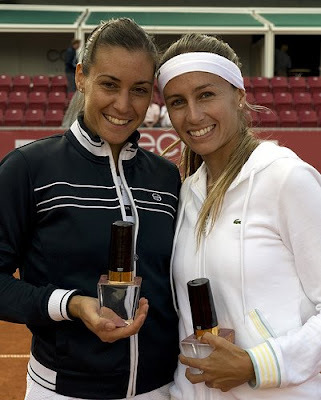 In the doubles final, Gisela Dulko and Flavia Pennetta denied Martinez Sanchez a double, who partnered with Nuria Llagostera Vives with a 6-2, 0-6, 10-5 victory. The men’s Swedish Open starts Monday.